Adult squash bugs are large, gray to brown garden insects. The adults overwinter in plant debris around the garden, under rocks, etc. When they emerge, late May to early June, they fly to growing cucurbit plants to feed and mate. The females lay eggs on the underside of the leaf or along the stem. Eggs hatch in about 10 days. Nymphs go through five stages to reach maturity, this takes 4 to 6 weeks. It is not uncommon to see multiple stages at one time. 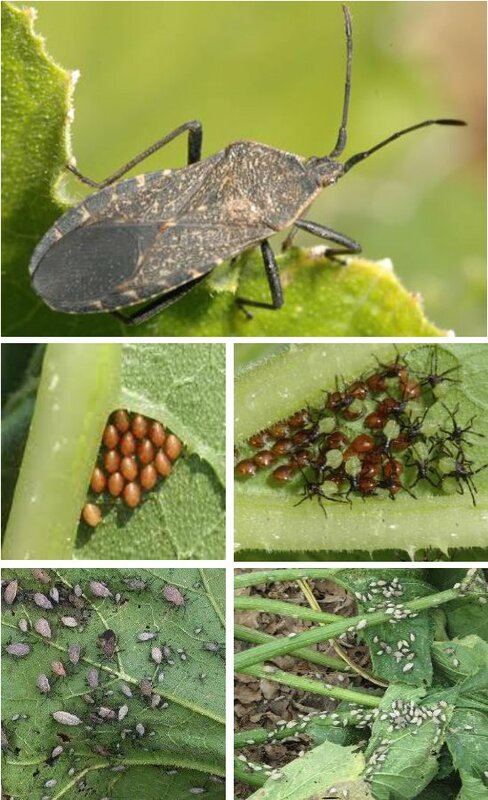 Squash bugs are very mobile and move up and down stems and from plant to plant. 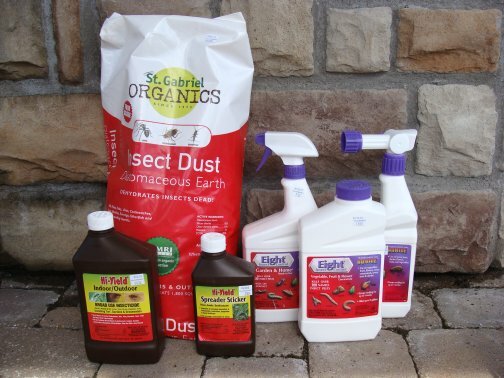 You can use this to increase the effectiveness of insecticides. They also spend most of their life on the under side of the leaves. Permethrin, available in a few different application options, is a good insecticide to use to control this pest in all of its stages. However, it is required to add Spreader Sticker to liquid spray for it to be effective on the last two maturing and the adult stages. When trying to control Squash Bugs a two pronged approach is BEST. Focus the liquid insecticide on the under side of the leaves and down the stems. Spreader Sticker helps the insecticide adhere to the plant surface as well as stick to the waxy skeleton of the adults. After the liquid has dried, apply Diatomaceous Earth where the stems come out of the ground, out to the first blossoms or fruit. This will control mobile insects and adults. Repeat both as needed.